TCL Communications has launched few device which will be coming to Indian market on 24th April and Alcatel One Touch Scribe Easy 8000D is one among them. Alcatel One Touch Scribe Easy is also a slim and light weight device like Alcatel One Touch Idol 6030A. This device can be a good competition to the Micromax A116 which recently has created a boom in the market. Both the device got many common features like Android 4.1 and a 5 inch display, but there are few which could help Alcatel Scribe to beat the boom of Micromax A116. The Alcatel’s scribe easy has a thickness of 8.5mm versus micromax ‘s 10.7mm. The battery is also better in Alcatel with 2500 mAh capacity where as Micromax A116 has 2000mAh battery. The Alcatel lacks in Camera as it has 5 MP where Micromax got 8 MP. So the competition will be interesting as both have some good and bad to compete. The One touch Scribe Easy is thicker and heavier than the one touch Idol 6030 with the 9.8mm thickness and weighs around 163 grams. The Dimension of this device 143 mm* 78.4 mm + 9.8mm. So this is a big phone with a good display size. This Android smartphone is presented both in a single SIM as well as a dual SIM configuration. 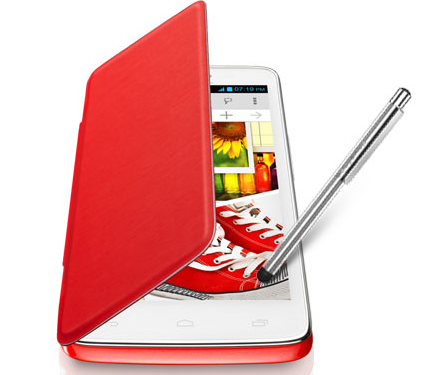 This one comes with a 5 inch screen with WVGA resolution, powered by 1.2GHz Dual core processor. so you can have a good performance experience with a better display while watching movie on the device, reading book and playing games. The device will be operating Jelly Bean 4.1 OS. RAM, with 1GB RAM and 4GB internal storage and micro SD support. This handset comes with a 5MP rear auto focus camera and a front VGA camera. Other features included are 3G, W-Fi, GPS, Bluetooth, 3.5mm jack and micro USB. The battery is also good with the power of 2500 mAh capacity. The device has got a pretty good look with 9.8mm thickness and weighs around 163 grams. With the looks the latest android version will an another attracting feature for the user. The battery with 2500mAH battery also looks a powerful and the interesting thing will be if the device can compete the already in-demand phone Micromax A116 and how much response it could seek from the users. It will be available in the indian market from 24th April and the pre-order has already been started and can order the device from Infibeam for a discounted price of Rs.12,090.